I got word that there was a chance to see and review this film and jumped at the chance. I had reviewed a previous production by these folks called THE BIG BAD and had enjoyed it, so I was excited to see their new offering. And - spoiler - I loved it. 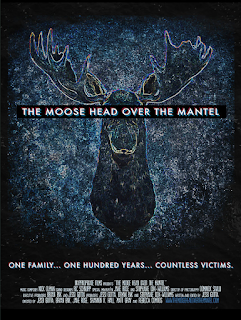 The Moose Head Over The Mantel review comes with a main caveat: This isn't your standard horror film. It's not a simple watch that you half pay attention to while gulping down handfuls of popcorn. There are some complex goings on here that require thought. If you're wanting horror bashes like HATCHET or THE CONJURING, leave this one alone - you probably won't be happy. However, if you like fine acting and an excellent story presented in an absolutely interesting way, proceed! One family. One hundred years. Countless victims. Love it. We have it all right there. The Moose Head Over The Mantel tells the story of the Hoffhienze Family. 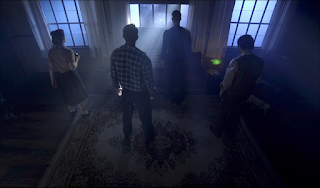 A family with a past filled with tragic stories. As 1983's Lillian Hoffhienze-Bachman, her husband Jay, and their son move into the family home, the onionskin-like layers of family history unfold. We have six stories that go all the way back to 1881, all seen by the titular...moose head over the mantel. I loved the concept. It's a fun and entertaining way to present things. While the gimmick of the moose head isn't 100% (We see several angles of the room, but I let it go after the first few minutes) the story is super solid and the use of the head as a central hub was very cool. People see the huge thing and all have questions about it. And, it seems to move as well. That combined with some very cool sound designs and music queues keep the flow and pace of all the stories super fluid and kinetic. We jump around in time between 1983, 1966, 1945, 1922, 1904, and 1881 seeing how generations of Hoffhienze seem to be the center of horrors of various sorts - "a bloodline wrought with abuse, dysfunction and violence." As things move on, you see the patterns and understand that the family is doomed to be in this violent cycle. All the stories are strong here, which can sometimes be an issue in multi-story line films. I've seen anthologies where you love one of the four stories and that's a sad thing, indeed. I found something special in each one of the tales and thought that the way they were presented was exceptional. It was like watching a fluid play that worked like a top notch time piece. The gears of the story spun along and you saw various time periods whirl before you, but I never felt lost or confused. I believe this is due to the strong writing style of Jessi Gotta who also played Lillian Hoffhienze-Bachma. She knows how to write characters you actually care about and are interested in. Combine that with and additional five, solid Directors that have a background in producing and performing live theater and you have gold. Now, this is a slow burn of a film. No MTV like cuts or music videos here. You need to think about it like we're setting in for an atmosphere filled, gothic tale. Spooky tales told around the fireplace. Maybe a moose head peering down at you eerily in the firelight. :::grin::: Old tales of the past. Creepy tales spawned by real life stories. Yet another interesting layer the film. 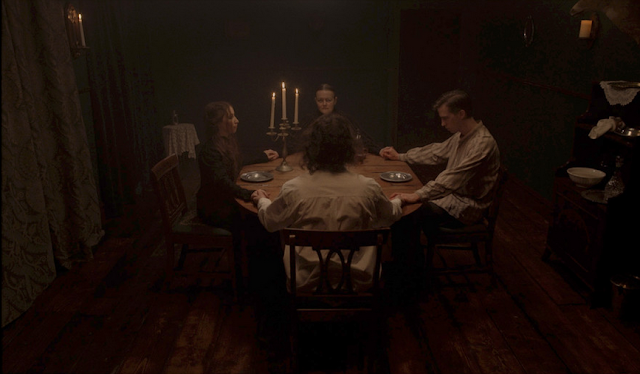 The Hoffhienze family story is influenced and inspired by the notorious lives of H.H. Holmes, The Bender Family, Lizzie Borden, Carl Panzram and The Fox Sisters, as well as the Spiritualism movement of the late 19th and early 20th centuries and the rise of psychiatric pharmacology in the 1970s and ‘80s. I highly recommend The Moose Head Over The Mantel. It's not just a film. It's an experience. An immersion into a series of spaces and time periods that adds a new and vibrant energy into a genre that can really use it! 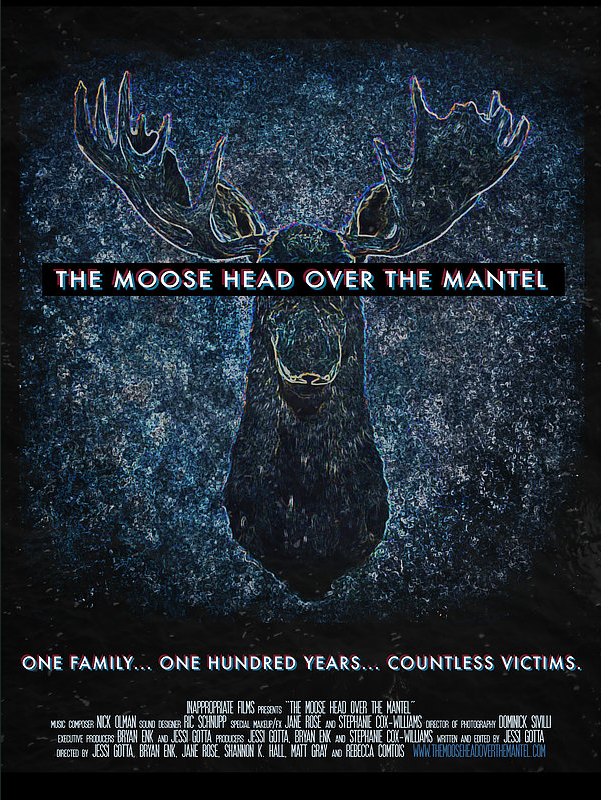 THE MOOSE HEAD OVER THE MANTEL | TRAILER from Inappropriate Films on Vimeo.